You experience two different cultures on a single island. The northern half is French, the southern half, Dutch. St Martin has the better dining, St Maarten has the better nightlife. St Maarten wins this crown by a big margin. St Martin speaks French, St Maarten speaks Dutch (though English is widely understood on both sides). St Martin is a French Territory, St Maarten is part of the Netherlands Antilles. St Maarten is slightly larger. St Maarten has far more tourists. St Maarten wins by an edge. 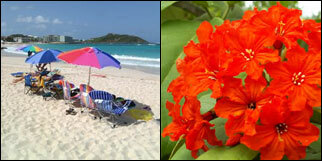 Orient is the most popular beach in St Martin while Maho Bay is the most active in St Maarten. The problem with the latter is you are noisily buzzed by low flying jet airlines landing and taking off over you. Left photo in my montage is copyrighted by the St Maarten Tourist Board and the right photo is copyrighted by the St Martin Tourist Board. Both are used with permission.